Albury Street (formerly Union Street) 1906. Spent a good deal of my early years at No. 29. My nan lived here most of her life from 1900 onwards. I remember here, at the Church Street end of Albury Street, there use to be a pub called the "Kings Head". Many a summer evening I and my brothers have sat outside drinking Vimto and eating the statutory bag of Smiths Crisps (with the proper blue waxed salt bag) listening to the singing and piano playing. i remember it too Andy. The pub was originally joined to the terrace, yes ? if so that makes the flank and gable end of the house on the left a recent build? yes bro...I studied them the other day and they are built in the same style. I think its now called Albany House. They are the original houses. Something to do with the albany Institute. Im researching and will get back to you with an update. thanks ever so much for this fantastic blog, what a marvellous source of information. I live In Albury Court, 45 Albury street. The building was constructed in !995 and is a total new build as far as I have been informed. It was built on the old site of the `Albany institute later named albany empire, which is another whole historical journey! Permission was given for the developer to build it on the basis that they refurbished and made safe several of the other houses along the street. Including the old vicarage at no 35. The developer apparently ran into financial difficulties and the project was completed by another company. If you need any more info on the Albany institute i can point you in the right direction, as john turner the man that ran the building, recently put a historical promenade performance together called "Deptford stories". I would love to find some more photos of the eastern end of Albury Street. Once again thanks for this great resource. I'm so sorry I missed your original post.. Thanks for your comment on my site and the information you supplied. Can I ask a favour. I am researching the Albany Institute and wonder wether you coulf contact your freind John Turner on my behalf. I looking for any info on the Deptford Babies Hospital. I know the Lewisham Local Studies have original papers from the institute but perhaps John knows another source of infomation. Ive tried contacting the Albany.org but have had no response. Granddad (Maurice Gobey, Son of Alfred) grew up in Deptford (born in Stroud in 1909). My Uncle Dave still lives up in Charlton. Nice to see some older shots of Granddads old neighborhood. Alfred moved to Deptford in 1920. From what I understand, the Kings Head Pub was at the corner of Church and Albury. My ancestors owned it from 1881-1898. Thank you for a fascinating blog, Andy. I refer to it every so often as I have ancestors from Deptford, and wanted to say thank you for all the hard work you've put into the research. My Russell family lived in Mary Ann Buildings, and two of the girls worked in service for daughters of the Webb family who lived at 15 Union Street (Albury St) back in the 1860-80s. Has all the numbering changed on Union Street now? And do you have any images/references of the Mary Ann Buildings residents? Thank you for your kind comments about the website. To answer your questio..Yes numbers have changed. I am at present working on the numbering changes in Union/Albury St. If you read the History of Albury St. here there is some references to what the numbers were back in the late 1890. I will post some photos of Mary Anne Buildings soon. Thanks Andy - can't wait for Mary Ann Buildings pics! One of my Russells worked for a Webb schoolmistress working at the Wesleyan Chapel School in Lewisham. I assume it was on the same circuit as the Mary Ann Buildings Wesleyan Chapel (now a more modern Sally Army building). Does anyone know anything about the original chapel or the Wesleyans of the area? Can you remember the White family in Albury St? I have to say this is an incredibly impressive piece of research. Thank you for your hard work. I have looked at it a few times as ancestors of mine lived in Union Street. The re-numbering and demolishing had left me with the thought that I would know no more than I had found for myself. Olivia’s recent post however leapt out as my family descend from the Webb family you mention Olivia. James Richard Webb and his wife (Harriet Catherine Ramsey) lived in number 15 Union Street from about 1837. James eventually dies there passing it on to his eldest daughter, Margaret Smith Webb a spinster School-mistress. She is my second great grand aunt, her brother Joseph being my great, great grandfather. If either of you have any more info on the house or the Webb family – I would love to hear it. Hi Charlie, thanks for your positive comments on the blog. I have to admit its not all my work. I am indebited to all the people and locals who contribute to this site especially Proffesor A Quiney for allowing me to reproduce his written difinitive work on Albury Street. Glad to have you on board. I was so thrilled to hear from you. Let me verify what you say and ask you a few questions. My father was Jimmy White and his wife was Pat White. They lived at No. 29 with my Grand Mother who's former name was Diggins! Aunt Clara was my Dads sister. You must have lived not at 29 but 34 Albury St where my aunt Jeanie (is this your mother ??) lived. I believe her surname was Senner. Where do you live now? Your house is still standing. Mr & Mrs Tegg live there. My mum, Pat, and your mum Jeanie were very good friends. We were always in your house at the weekends and during the week waiting for my mum to finish work as a dinner lady at Creek Road school. Please send me an email with your contact so that we can talk. My mother is still alive but my father died in 1979. You can contact me by email which is ...axelgs1@yahoo.co.uk. I look forward to hearing from you. Here's an update. After talking to my mother she tells me the we are related. I and my twin brother are second cousins to you... I think. My Grandmothers sister was Mary who I believe was your Mums mother..your Grandmother. Was your dads name Bill? Please get back to me as my mother would like to know more of your family and how you all are now. That's interesting about the tunnels. My Nan who lived at No. 29 said there was a tunnel behind the basement fireplace where a big range was sited. My father and his brother explored the tunnel which led to the Creek which was much nearer than it is now. They traveled a long way down it but the further they went more water they discovered. They also found an old musket leaning against the wall! When did you live there at 36. Did you ever hear about the haunting in No. 34 next door? Can you tell me more about the haunting? My aunt Jeanie Senner lived in No 34 for many years and always knew and had experienced the haunting herself. She once saw a shimmering figure standing at the top of the stairs, doors would open by themselves as well. My father found a secret door in the garret (attic) which connected your house and there's. Also a former resident, Mrs Wilcox in the 1950's reported the same happenings. My mother was witness to the doors keep opening whilst she stayed there on occasions. When did you live there and did you know there was a door in the attic. That's just the information I was looking for. When I say the attic or Garrett as it was known I meant the top most room with the little bay windows. If you go to this link on this website you will see reported haunting's of 34 and 36.
just cut and paste in the address bar. Charlie (posted 23rd May 2012) I just saw your post and wanted to say thanks for picking up on my comment re the Webb family... What are the chances of that?!? Remarkable. In 1871 your Margaret Smith Webb was a governess at the Lewisham school where my g.grandmother Louisa was a servant. 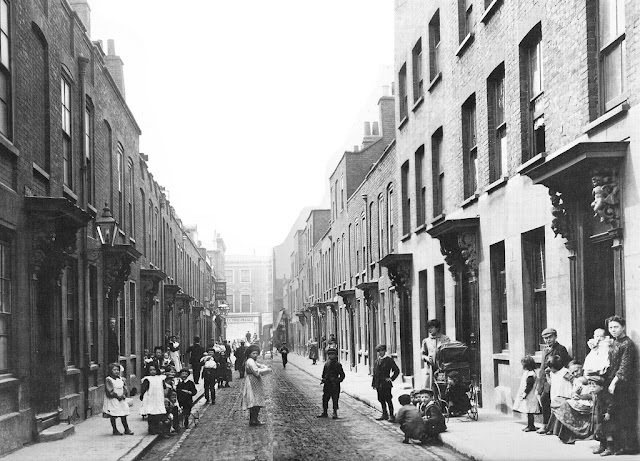 They lived in parallel streets to each other (Albury and Mary Ann Buildings, Deptford). Louisa's sister was also in service to Margaret's married sister Eleanor Timbury. Increadible resource for anyone researching their Deptford ancestors. living in 1901 and was directed to this site I was amazed. You mentioned the re-numbering, when did this take place? Street 1901. Was it around then? My wife was born at #35 Albury Street in 1939. It was then occupied by the Griffiths family. We have been to this house in 1960 when the Griffiths still lived there. We have since visited in 2002 and now there is a plaque on the wall put there by the National Trust (we think) which refers to Lady Hamilton living there in the 1800's. However wikapedia does not reference this. What is the truth, anybody know? Terry Griffith was may brothers God Father. We grew up at No29 and knew the family well. My Aunt Jeanie lived at No 34 which was the reputed place that Lord Nelson stayed at times. This was handed down over the past 200yrs by word of mouth. I did however discover that when the Albany Institute sold the 3/4 house(Nos. 34,36,38 and 40) which they owned the inventory listed items from Nelson ship the Trafalgar, namely the back door which was one one the hatches and his private locker chain which hung behind the front door. So there is a connection somewhere. It was also said that Lady Hamilton stayed at No.36. My father discovered at secret door in the Garret(attic) which connected 34 and 36 which it was said they use to meet privately through this door. I have researched at the Maritime Museum but to date this is the only connection I can find. Please could anyone tell me if the older houses in Albury Street had dumb waiters? What a very interesting site - thank you. I've discovered that my gran was born in Aldbury Street in 1902, her mother (my great-grandmother) Elizabeth Klein was housekeeper at number 20 - would anyone know who lived there? Hi Andy....My family and I lived in Albury Street from around 1959 - 1967, my sister lived in one of the end Georgian houses too. Then moved on to Tanners Hill eventually. I knew many of the families that lived there, sat on the step of the Kings Head when the governor Mr. Toy used to manage it. Play in the Albany and the opposite bombsite. The Macmillan Nurse house and Pickfords Depot. Lots of memories and but would like to ask you if anyone has any information of a pub in Grove St, called the Ship Defiance. Would be really interested to find out anything related to the period 1820s - 1830S....Kind Regards Joyce Boyle. Hi, Just found this site, and saw the comments about No. 34. I heard the same thing about Nelson staying there. How true that is I can't say, but it was talked about in the 50's, when I lived around the corner in Church St.
My grandmother lived in Albury Street on the right side looking toward the High Street. Her name was Florence Barnes ( also known as Dolly ) She had 5 children - George, Charles, Peggy, Doris and Vera. Doris died of TB in Hithergreen Hospital. My mum, Edna lived there for a while during the war when my brother, Gary, was born. A bomb went off nearby and blew the window in but a wardrobe had fallen across his cot and saved him. George married my aunt Mag who ended up living in the top of the house. Eventually my Gran had to move out and was given a flat on the Orchard Estate near Lewisham. Gran was a cleaning lady for a butchers in the High Street. I wonder if anyone remembers her. I'm researching my wife's family tree on her Dad's side. Her Nan was a Richards (born 1913) and in 1901 her ancestors were living at 38 Albury Street. I've been reading this great blog/site with interest and have checked out Google street view and re-watched that marvellous BBC Secret History of our Streets for the Deptford episode. Would love to know if anyone has any links or family recollections of number 38...? Her Great Great grandparents George (a cattle drover at the foreign import market) and Elizabeth had a number of children - George (my wife's great grandfather, eldest son and aged 20 at this point, he worked at Wheen & Sons soapworks, and joined the Royal West Kent Regiment in 1902 for about 6 years, then was also a drover at the cattle market, then dockworker, and apparently was a boxer - probably amateur. Other children in rough age order were Arthur and Bert or Bart (mid teens) who worked at a Dry Dock and Soap Works respectively. Youngest kids at this point were Emily, Alfred, and Ernest (12 yo, 9yo and 5yo). By the 1911 Census they had moved to 54 Creek Road and that's where the family remained until sometime in the 1950s or 1960s as my father in law regularly visited his grandmother and other relatives there. My family name of Pearson lived in Albury St around about the 1940s,we then moved to an alley next to Mary Annes Buildings called Andom Terrace,I remember going into the tunnel in the cellar and trying to clear it out with some mates because we believed it led down to the water gates by the river,but the roof had collapsed and we could not do it.My mother told me stories about the houses being haunted and meeting a woman one night when she walked up the stairs to bed the woman slapped her face and disappeared when mum woke up in the morning she still had the hand marks on her face.We used to use the Kings Head pub when it was called the Blue Light,and my dad use to take the boxing training in The Albany which was sponsored by Goldsmiths College there were 5 brothers and we all boxed and won various competitions and were nicknamed the fighting Pearsons.Reading your blog brought back lots and lots of memories. That's great information. Tell me what number did you live at in Albury Street?